This web site will put you in touch with some entirely new thinking about depression which began with the publication of the book DEPRESSION IS A CHOICE: WINNING THE BATTLE WITHOUT DRUGS by A. B. Curtiss. It has expanded now with the publication of her new book BRAINSWITCH OUT OF DEPRESSION: BREAK THE CYCLE OF DESPAIR. On this site you can read some of the latest writings about depression from many important thinkers who look beyond prescription drugs for their answer to depression, ADHD, and anxiety.You will find articles here by well-known leaders in the field of mental health. You will also find some helpful doÕs and donÕts for when depression hits. The section of mind exercises can help change the habitual neuronal connections in your brain that contribute to depression. 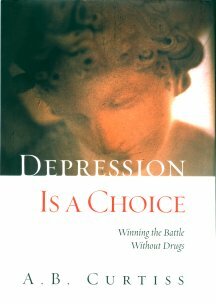 DEPRESSION IS A CHOICE was the first book to point out the significance of directed thinking (as opposed to passive thinking) and the process of pain perception in getting out of depression without drugs. BRAINSWITCH OUT OF DEPRESSION, further expands upon directed thinking to create an actual system called brainswitching which can be used to get rid of any kind of depression without drugs.. This web site began as a forum to answer all the questions people bombarded me with after the publication of my book DEPRESSION IS A CHOICE: WINNING THE BATTLE WITHOUT DRUGS, and the presentation of my research before the National Board of Cognitive Behavioral Therapists at their annual meeting, after the publication of the book. 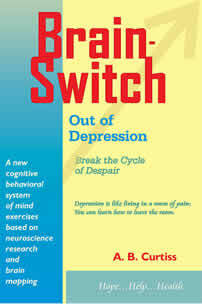 Now there is a lot of interest in my new book BRAINSWITCH OUT OF DEPRESSION: BREAK THE CYCLE OF DESPAIR. So the website will be expanding to cover the new book as well. I am often asked to explain the difference between the two books. DEPRESSION IS A CHOICE is the memoir of my journey out of manic depression. They call it bipolar now but I still prefer the older term for its more graphic description. The book shows the progress of my ability to handle the difficulties brought on by my condition. It delineates the philosophy my early thinking—how I thought as a bipolar, how I behaved as a bipolar. Then, as my understanding of the workings of the brain expanded, and my study of ancient wisdom advanced, the book follows the subsequent changes in my thinking and behavior. By the end of the book you can see how the old depression and mania which used to control my life was now under my own control. I still retain the manic-depressive personality of high activity and creative output. But I no longer suffer either depression or mania. I may be temporarily thrown into depression or mania because I spent so many years being depressed that those old neuronal patterns are practically hard-wired in my brain. But I immediately employ mind tricks which take me out of either depression or mania in minutes, instead of the weeks and months it used to take. Many people who have read this first book have been able to come off their medication with the help of their doctor. My second book, BRAINSWITCH OUT OF DEPRESSION: BREAK THE CYCLE OF DESPAIR is a synthesis of the first book into a more simplified how-to book with many, many exercises and the important, graphic things you need to know about the workings of the brain in order to get out of depression and anxiety when it hits. One reader joked that BRAINSWITCH OUT OF DEPRESSION is like a get-out-of-depression-free card. I was the third person in my family, after my father and brother, to be diagnosed with manic depression and I suffered with it for more than 30 years. I went from one psychiatrist to another looking for an answer to my pain. My father and my brother had terrible problems with their doctor-prescribed drugs and therefore I did not take them myself. Instead, I’m one of those people who went into the field of psychology to help myself. Ultimately I became a board-certified cognitive behavioral therapist and certified hypnotist. I found in my study of the research of neuroscience, brain-mapping and ancient wisdom the answer to depression for which I had been looking so long. My research included the physiological components of our feelings—how do we feel what we feel? I studied in depth the neuronal process of pain perception, the process whereby signals from the emotional part of the brain (the subcortex) must travel upwards and be acknowledged in the thinking part of the brain (the neocortex) before a human being is able to feel any pain or emotion. This moment of neo-cortical pain perception is such a tiny event, brain-wise, that it happens beneath our level of awareness. But this small instantaneous process underlies the reason depression is cyclical. Depression only happens in the subcortex. There is never any depression in the neocortex and you can learn how to brainswitch from the subcortex to the neocortex when depression attacks. This switch in increased activity in the neocortex happens naturally even in the worst depression and is the reason that depression is cyclical. At some point the brain naturally shifts neuronal activity from the subcortex to the neocortex but you can learn to do it as a matter of will to immediately alleviate the pain of depression or anxiety. Another part of my research concerned the capabilities of the human attention span that is the scientific basis for medical hypnosis and Transcendental Meditation. To simply the principle—the mind can only concentrate on one thought at a time and you can think any thought you want. This is why it is possible to do heart surgery using no anesthetic but hypnosis. This principle and the principle of pain perception coupled with simple preventive strategy, mental exercises and mind tricks can literally brainshift you out of your depression anytime it comes down upon you. As far as I know I am the first person to recognize the significance to depression of the natural process of pain perception and how to use it to get out of any depressive episode as an act of will. I invite you to ask questions, to suggest topics or research you would like to see us cover, and to contribute stories of your own experience of what has worked for you. Looking forward to hearing from you.